It's another sometimes-weekly minor league review, where we take a look at the various developmental levels of the Phillies' organization and some noteworthy players from each club. Tyler Cloyd (pictured, right) continued his dominance of the year 2012 in his latest start. The 25-year-old righty notched the win against Pawtucket on Thursday, allowing just one earned run in seven innings of work. The victory took Cloyd’s record to 14-1 and his ERA in 1.91 in 22 combined starts at Double-A and Triple-A this season. The Phillies’ 18th round draft pick in 2008 has been making it extremely difficult for the Phillies to not promote him to the big league roster. Recently promoted second baseman Cesar Hernandez headed into action on Saturday posting the following numbers over the previous week- .476 batting average, three doubles, one triple and the RBI. Additionally, Hernandez hit safely in seven consecutive games beginning last Friday. The 22-year-old was among Reading’s Eastern League All-Star representative’s this season. J.C. Ramirez has had a rough time lately for the IronPigs. In the right-hander’s last nine relief outings, he has sported a 1-1 record with a 9.88 ERA. Overall this season, the Nicaragua native has tallied a 2-3 record with four saves, a 4.94 ERA and a .250 batting average against over 34 combined outings with Double-A Reading and Lehigh Valley. Ramirez will turn 24-years-old on August 16th. Darin Ruf, the R-Phils’ All-Star first baseman, laced two home runs in Reading’s 4-1 win over Binghamton on Friday, then followed that up with a home run in game two of the R-Phils' double header on Saturday. The 26-year-old Ruf leads the Eastern League in OPS with a .948 mark. The Creighton University product with the Phils’ 20th round draft choice in 2009. Julio Rodriguez, finished the month of July with a 1-3 record and a 6.58 ERA in six outings and continued to struggle in August. On Saturday, in a start against Binghamton, Rodriguez allowed seven earned runs in five innings pitched and suffered the loss. The 21-year-old Puerto Rico native entered July with a 3.23 ERA but now sports a 4.40 mark. Rodriguez, an 8th round draft pick in 2008, was also among Reading’s EL All-Star representatives this year. First baseman/designated hitter Chris Duffy (pictured, left) stayed hot upon a return to the Threshers this week. Following his efforts with Lakewood this season that saw him post a .384 batting average with 11 HR and 56 RBI in 60 games, the left-handed hitting Duffy went 6-for-17 (.353 avg) in his first five games back with Clearwater this week. During a stint with the Threshers earlier this season, the 24-year-old Duffy sported a .205 batting average in 19 games. Catcher Cameron Rupp went 1-for-23 (.043 avg) over his past seven games, dating back to last Friday. Overall, on the season, Rupp was still sporting a .252 average with 9 HR and 42 RBI in 85 games played thus far in 2012. 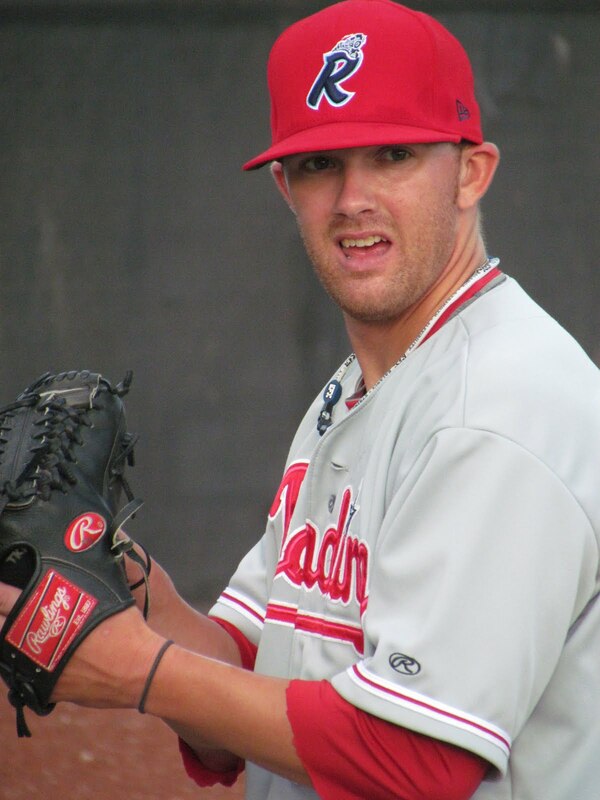 Rupp, a Florida State League All-Star, was the Phillies’ 3rd round draft selection in 2010. LHP Hoby Milner posted a 2-0 record without allowing a run in two starts dating back to last Saturday. Since making his BlueClaws debut on July 1st, Milner has paired as a battery with former college rival Josh Ludy three times. In those three starts, throwing to a backstop that dominated him with the bat while playing college ball, Milner has not allowed a single run while striking out 14 and walking just five in 17 2/3 innings. Comparatively, in his four other starts for Lakewood, throwing to other catchers, Milner sports a 7.02 ERA with 14 strike outs and 10 walks in 16 2/3 innings. Clearly, Ludy’s mastery of Milner with the bat and his apparent ability to successfully guide the hurler, which I wrote about HERE, is a real thing. Milner and Ludy were the Phillies’ 7th and 8th round draft selections respectively this year. Righty hurler Chris Nichols has been very good lately, sporting a 3-0 record with a 2.38 ERA in six recent relief outings. A 31st round draft pick this year, Nichols made his debut with the BlueClaws this week, throwing a scoreless frame against Delmarva, after 11 combined outings with the GCL Phillies and short-season Williamsport. The 21-year-old is the son of Lehigh Valley pitching coach Rod Nichols. Catcher Gabriel Lino, acquired from Baltimore in the Jim Thome trade, has not performed well since joining the Phillies organization. The 19-year-old righty hitter has gone 1-for-24 (.042 avg) in his last seven games and has hit .143 in his first 20 games overall for the BlueClaws. First baseman/third baseman/DH Cameron Perkins has tallied a .359 average with five doubles and three RBI in his last 10 games. Perkins was a 6th round draft pick by the Phillies this year. The 21-year-old Purdue product is batting .255 with 14 doubles, one triple and 18 RBI in 42 games combined with the GCL team and the Crosscutters. Entering action on Saturday, Larry Greene Jr. (pictured, right) had posted a .143 batting average with no extra base hits over his previous 10 games. The Phils’ top draft pick from 2011 is batting .249 with 10 doubles, two home runs and 21 RBI through 45 games this season at the age of 19. Infielder Tyler Greene, 19, has posted a .128 batting average in his past 10 games. The Phils’ 11th round draft pick last year has a .183/.251/.274 line in 60 games this season, split between Williamsport and Lakewood. 16-year-old outfielder Carlos Tocci has been doing extremely well lately, posting a .500 average (8-for-16) over a six-game stretch this week. Overall, Tocci is batting .328 in 27 games, although he has had considerably better success in home games (.417 avg) than he has on the road (.214 avg) since joining the GCL club. Zach Green, an 18-year-old shortstop, has been excellent lately, sporting a .350 average with four doubles, two home runs and eight RBI in his last 10 games. Overall, this season’s 3rd round draft selection has posted a .304/.362/.487 line in 32 games. Outfielder Dylan Cozens has cooled off after a very good start to his pro career. Over his last 10 games, the 18-year-old has gone 4-for-29 (.138 avg) with a double and two RBI. Prior to this current skid, Cozens, the Phillies’ 2nd round draft pick this year, had tallied a .302 batting average, but it has since slipped down to a .261 mark.